Is there anything more ladylike and feminine than a parasol? I think not. Apparently Tracy Reece agrees. 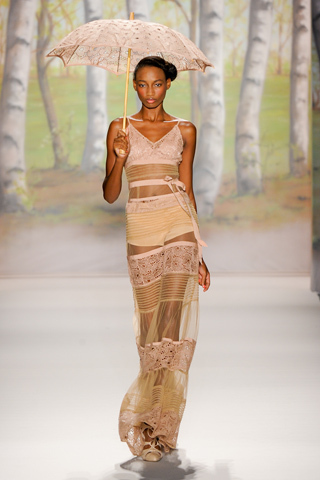 Check out a few looks from her Spring 2012 RTW Collection – complete with coordinating parasols. Perfect for a stroll down the beach. I love the vintage look of this suit and coordinating cap. This look takes me back in time. Elegant and Chic. It makes me think of Coco during her Deauville years. Not my favorite print by any means..but I just love the concept of a matching parasol. I love this look. I realize that it is not overly practical (or practical at all) - but wouldn't it make for a stunning swimsuit cover-up on vacation. 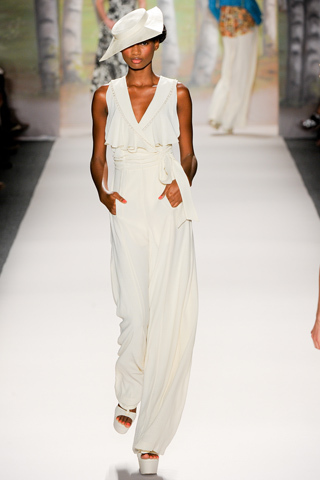 Perhaps I just have honeymoon clothes on the brain...but I think this could be "trousseau terrific"!